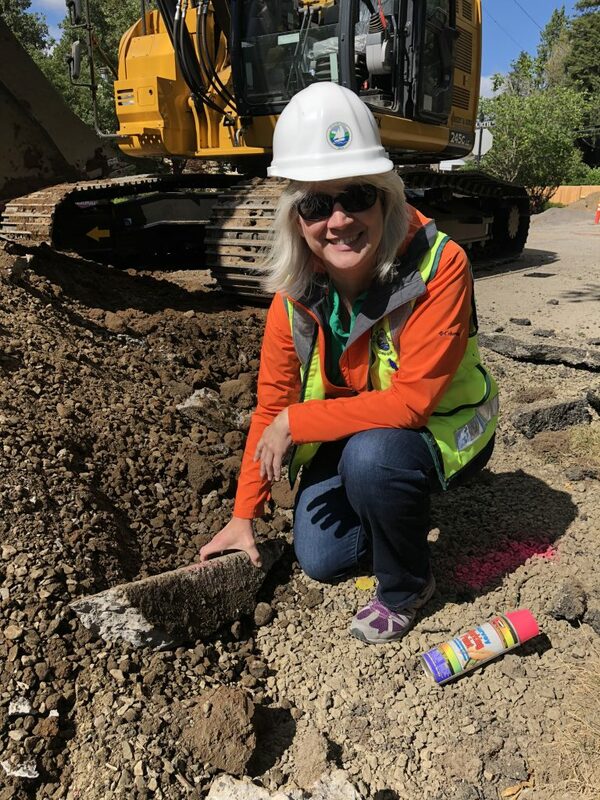 Over the last few weeks, Emery has focused on excavating the stormwater planters (treatment facilities) and rain gardens, installing liners, placing rock and beehive inlets (shown in the featured photos) and preparing for the new sidewalk. This week, a new crew started installing electrical conduit for the bollard lighting and continues with sidewalk preparation. Next week, concrete crews will arrive to begin pouring the new sidewalk! During the sidewalk work, alleys and driveways will be barricaded and closed at D Avenue to allow the concrete time to cure. During this time, residents who take driveway access on D will need to park on a side street. If you need to enter or exit the alleys, please use E Avenue or C Avenue. In the coming weeks, landscaping crews will begin installing the irrigation system for the new planters and preparing for new landscaping. Crews are working hard to get the sidewalk poured and major rain gardens excavated before the final lift of paving is placed. Due to paving sub-contractor availability, the final paving lift is now expected to take place the week of October 8. This will also include paving existing driveway aprons on D Avenue, 8th and 9th Streets between D and E Avenues, and a small portion of 7th Street near D Avenue. Crews need to rebuild new pedestrian curb ramps at the intersection of State Street (Hwy. 43) and D Avenue, and also repave this intersection. In order to safely conduct this work and to maintain a pedestrian route through this intersection, the outer southbound lane on State Street at the intersection of D Avenue will be closed 24/7 for about a week. This work is expected to start the first week of October. 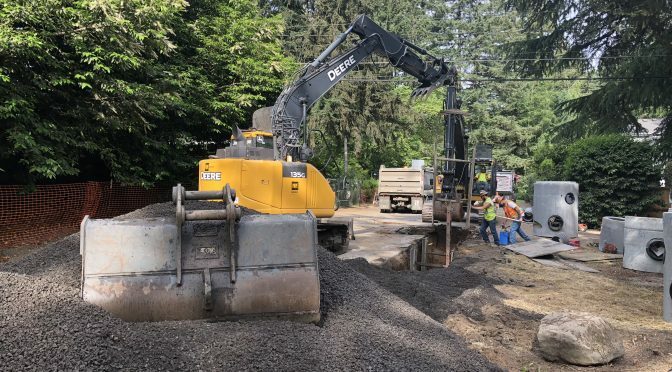 Warning signage will be placed on Terwilliger Boulevard and on State Street to alert drivers of the upcoming lane closure and a construction speed limit of 25 MPH will be in place. Please drive with caution, plan ahead and expect delays during this temporary closure. Although the full closure for D Avenue between 1st and 10th Streets has been lifted, intermittent rolling daytime road closures will be in place in the blocks where crews are working. This is expected to continue through fall, as crews work on the final stages of the project. 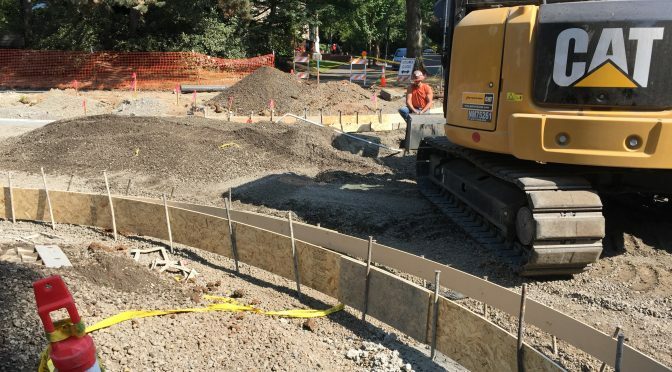 The first block of D Avenue between State and 1st Street remains closed to traffic, as pedestrian curb ramp work at the intersection of State Street is not yet complete. Please note, when the final top lift of asphalt is placed on D Avenue in early October, the entire ten blocks of D Avenue will be closed and the 10th street detour will be in place. To stay updated on daily closures, visit the road closures page. Remember, the road closed signs and caution tape are there for a reason – to keep you and the crews safe. Please do your part to stay safe, keep our construction crews safe, and keep this project moving towards the finish line. Plan ahead for extra time to travel through the neighborhood. Crews placed the first base layer of asphalt on D Avenue in late August, and lifted the full closure between 1st and 10th! The first block of D Avenue between State and 1st Street remains closed to traffic, as pedestrian curb ramp work at the intersection of State Street is not yet complete. Check out this video of paving taking place on D at 8th Street. 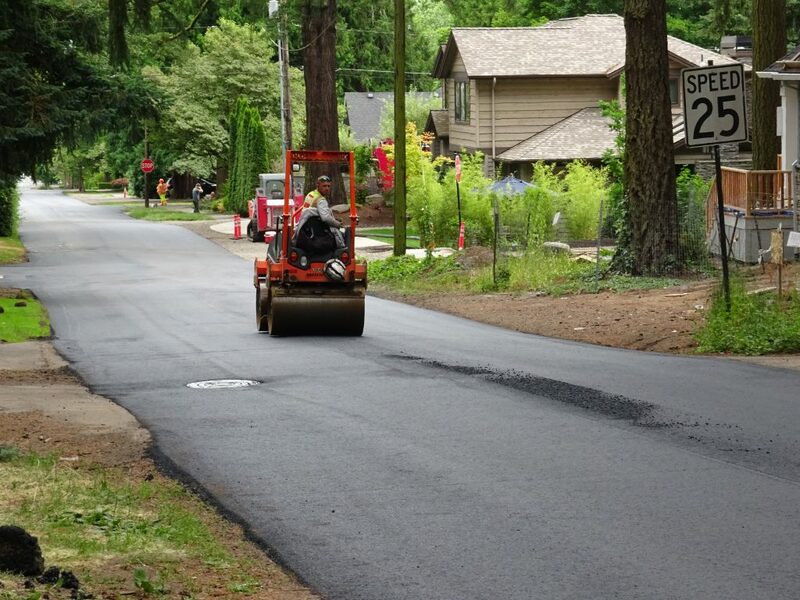 Late last month, 1st Street between D and E Avenue also received a new base layer of asphalt. The final lift will be completed later this month. 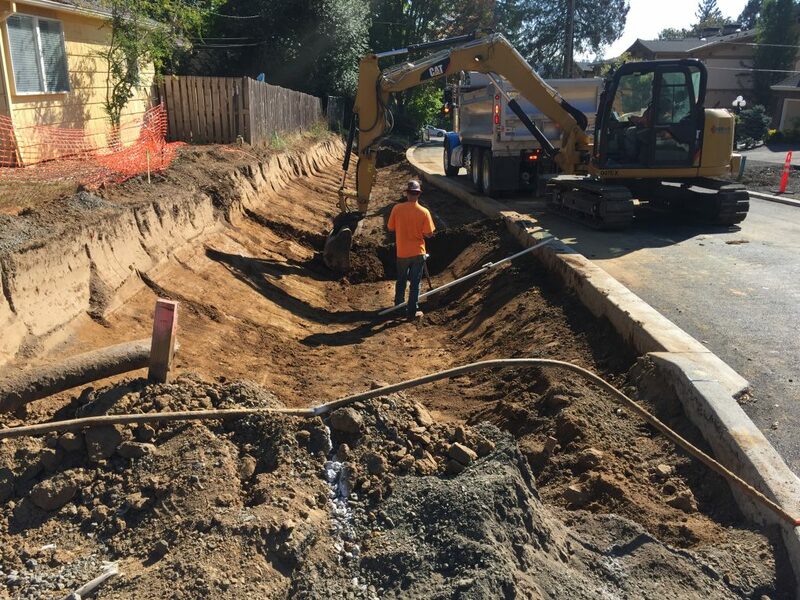 Last week, some minor restoration work took place on portions of 7thbetween B and D. Trench repair work also took place on 1st, 8th and 9th Street intersections with E Avenue. Restoration work will continue over the coming weeks. 8th and 9th Streets are expected to be repaved between D and E Avenues later this month when the final lift is paved on D Avenue. Crews are now focused on excavating the stormwater planters (treatment facilities) and raingardens, installing liners, and placing rock. This week, they’ve been working on D Avenue between 8th and 10th Streets, and will continue to work east toward State Street. Although the full closure for D Avenue between 1st and 10th Streets has been lifted, intermittent rolling daytime road closures will be in place in the blocks where crews are working. This is expected to continue through fall, as crews work on the final stages of the project. 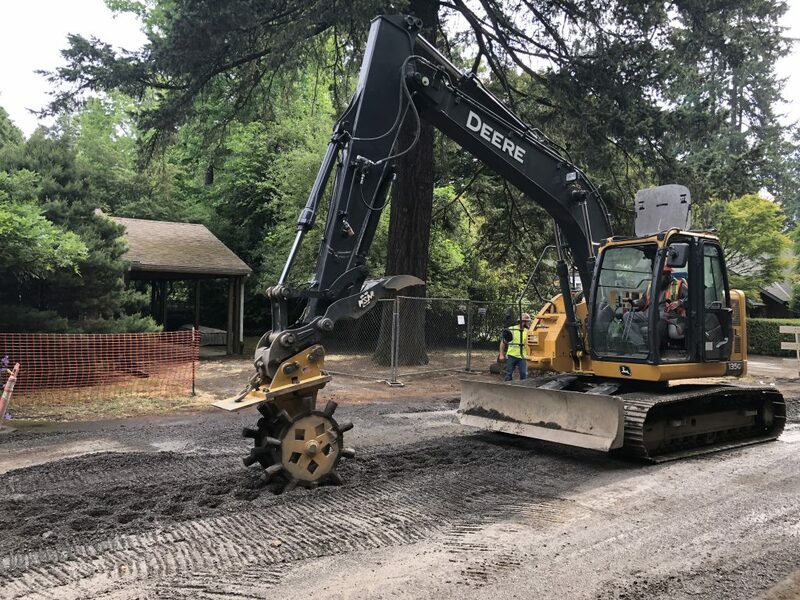 This work involves building the stormwater rain gardens, pouring the new sidewalks, installing the bollard lighting, installing the irrigation system, placing the landscaping, paving the final two-inch top lift of asphalt and miscellaneous restoration work. 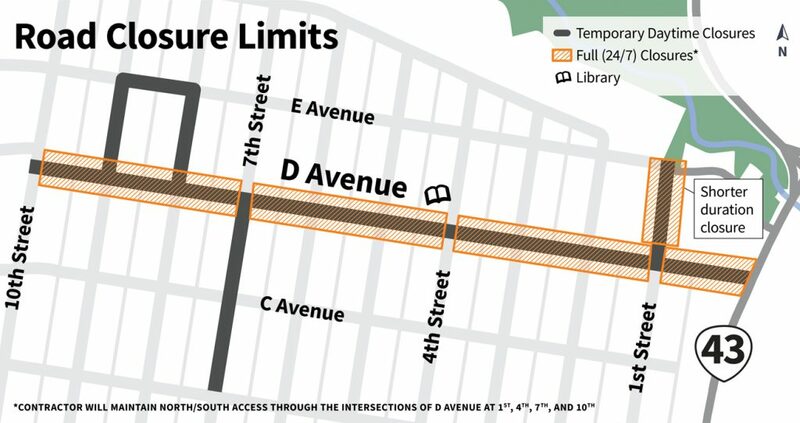 Please note, there will be one more occurrence when the entire ten blocks of D Avenue will be closed and the 10th street detour will be in place – when the final top lift of asphalt is placed (now expected in late September or early October). Crews need to rebuild new pedestrian curb ramps at the intersection of State Street (Hwy. 43) and D Avenue, and also repave this intersection. In order to safely conduct this work and to maintain a pedestrian route through this intersection, the outer southbound lane on State Street at the intersection of D Avenue will be closed 24/7 for about a week. This work is expected to occur in late September. 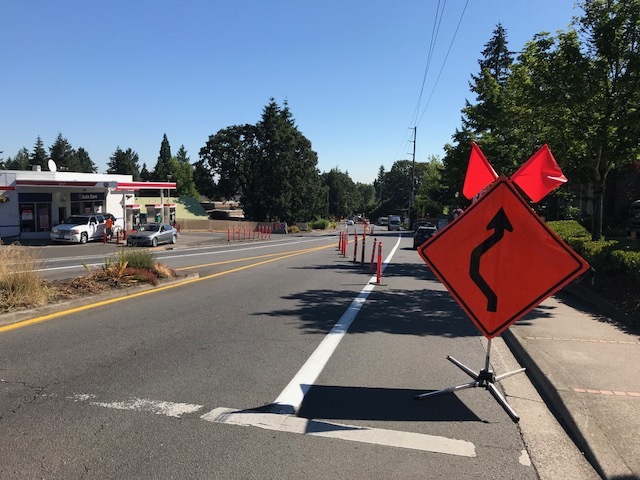 Warning signage will be placed on Terwilliger Boulevard and on State Street to alert drivers of the upcoming lane closure and a construction speed limit of 25 MPH will be in place. Please drive with caution, plan ahead and expect delays during this temporary closure. First Base Layer of Paving Starts Tomorrow! 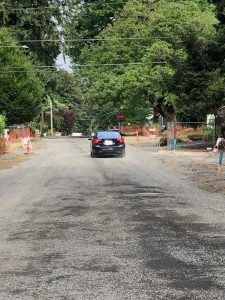 On Thursday, August 23, through Saturday, August 25, crews expect to place the first three-inch base layer of asphalt along the entire ten blocks of D Avenue. Additionally, they will grind the existing asphalt and place new asphalt on 1st Street, between D and E Avenue. 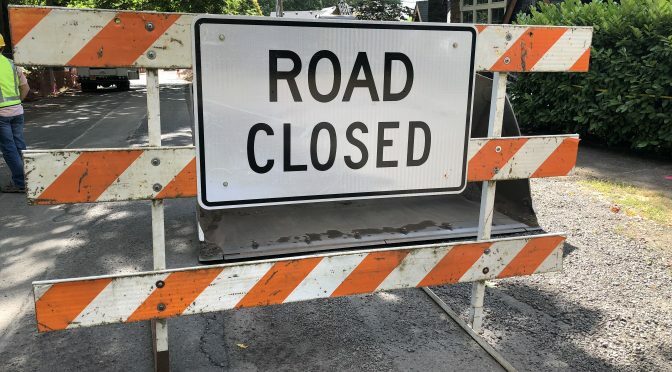 This will result in a complete closure of 1st Street between D and E Avenue, and D Avenue between State and 10th Street – including all north/south cross streets. All traffic will be detoured to 10th Street, and E and C Avenues. This is to allow the new pavement enough time to cool. Flaggers will be stationed at 1st, 4th, 7th and 10th to help redirect pedestrian, bike and vehicle traffic. During paving, there will be no on-street parking on D Avenue or 1st Street, between D and E.
Driveway access will be blocked. Before work begins on Thursday morning (7 a.m.), please move your car and find an alternate place to park on a side street that is open. Streets are expected to be open to traffic the day after new asphalt has been placed. 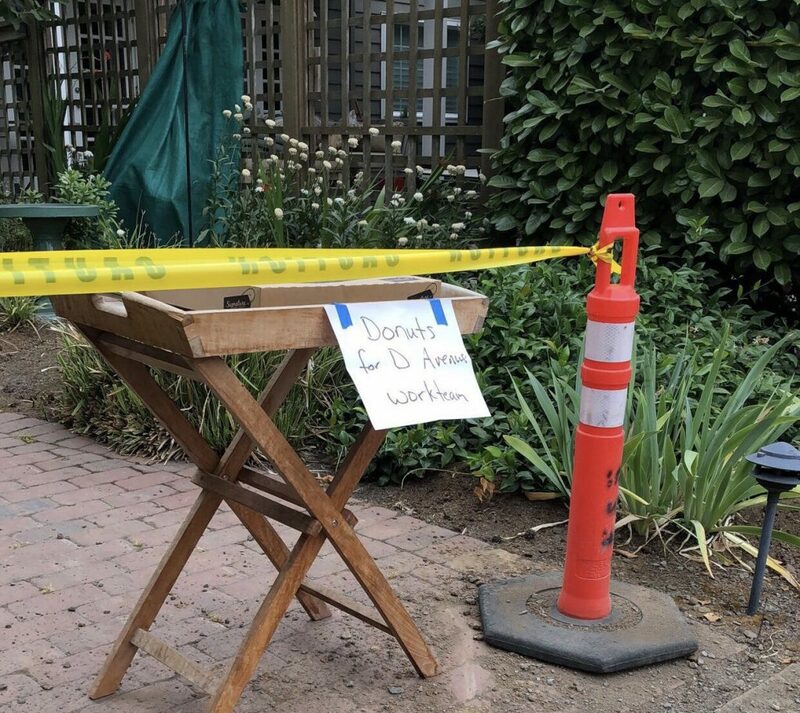 In order to stay on schedule, work hours will be extended on the following days: Thursday 7 a.m. – 8 p.m., Friday 8 a.m. – 8 p.m. and Saturday 8 a.m. – 6 p.m.
A special thank you to neighbors on D Avenue for your continued patience with construction. Crews are hoping to reopen D Avenue to through traffic by August 27, in time for school! 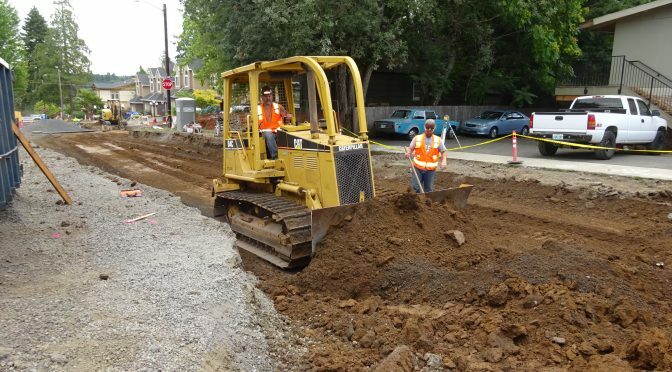 Although the FULL closure for the entire ten blocks will be lifted, intermittent daytime closures will resume through fall, as crews finish the final stages of the project. 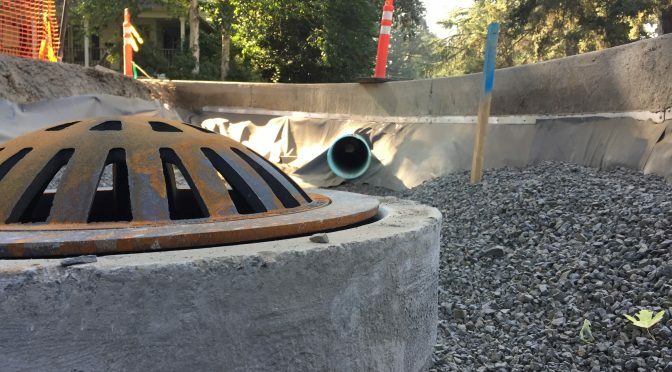 This work involves building the stormwater rain gardens, pouring the new sidewalk, installing the bollard lighting, placing the landscaping, paving the final two-inch top lift of asphalt and miscellaneous restoration work. Please note, there will be one more occurrence when the entire roadway will be closed and the 10th street detour will be in place – when the final top lift of asphalt is placed (currently expected in mid-late September). Crews are busy finalizing the finishing touches of the new concrete and preparing the roadway for paving. In order to help facilitate this, Emery plans to work tomorrow, Saturday, 8/18 and next Saturday, 8/25. Saturday work hours are 8 a.m. to 6 p.m. Reminder: D Avenue remains closed to east-west traffic from State to 10th Street. If you need to cross D Avenue, please only use 1st, 4th, 7th or 10th Streets. All other streets and alleys are closed at D.
Thank you, D Avenue and First Addition neighbors for your continued patience and understanding! The new roadway is finally taking shape on D Avenue! Late last week, concrete crews started pouring the one ft. wide concrete edging from State to 10th Street. These concrete bands will be flush with the new pavement (see below). Click here to view a video of edging being placed on D Avenue. 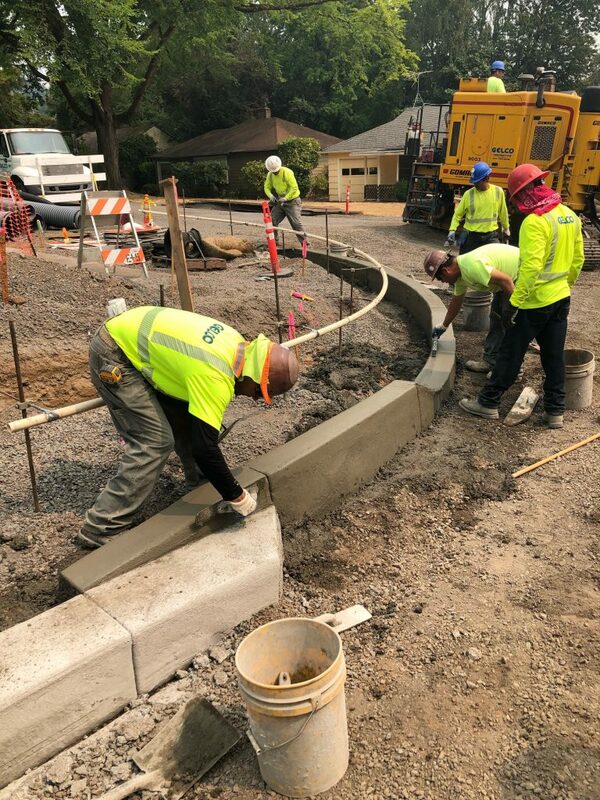 This week, crews are continuing on the valley gutters (edging that has a slight V to help channel the stormwater) and also the curb corners at each of the intersections. D Avenue remains closed to east-west traffic from State to 10th Streets. If you need to cross D Avenue, please only use 1st, 4th, 7th or 10th Streets. 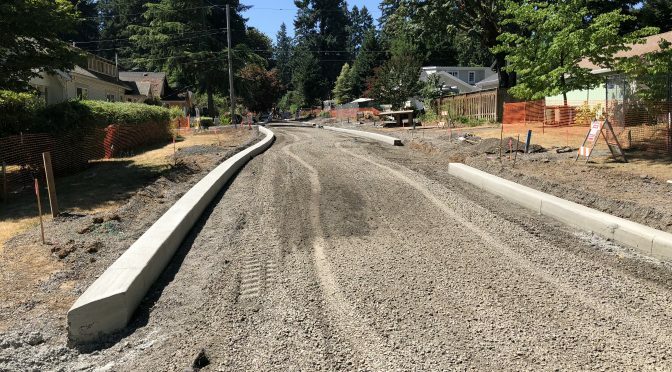 All other streets and alleys are closed at D.
Crews poured the first intersection curb corner today at 2nd, and are working their way west (pictured below). 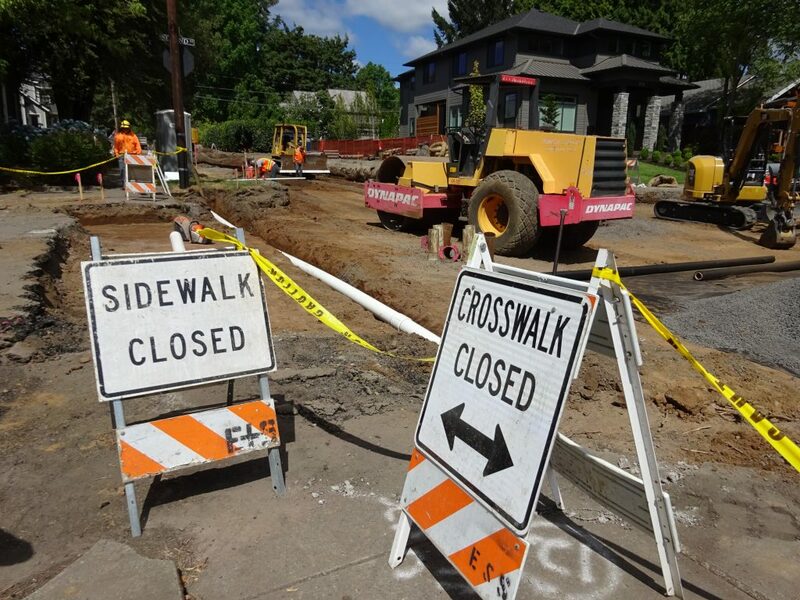 While crews pour the new intersection curb corners, temporary half day closures will be in place at each intersection – including 1st, 4th and 7th. Flaggers will redirect traffic to the nearest open cross street during this work. If you need to access the neighborhood during this time, it is best to use 10th Street to avoid any potential closures and work areas. Lanes will also be temporarily narrowed at the intersections – please watch for oncoming traffic and yield as needed. 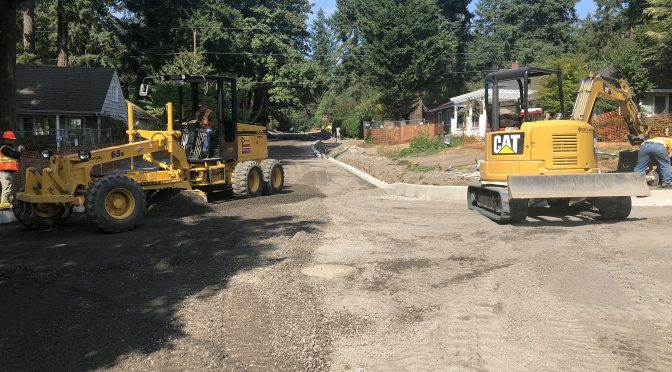 A special thank you to neighbors on D Avenue for your patience with this work, as several driveways have been blocked during this concrete phase. We will continue to work one-on-one with you regarding access. 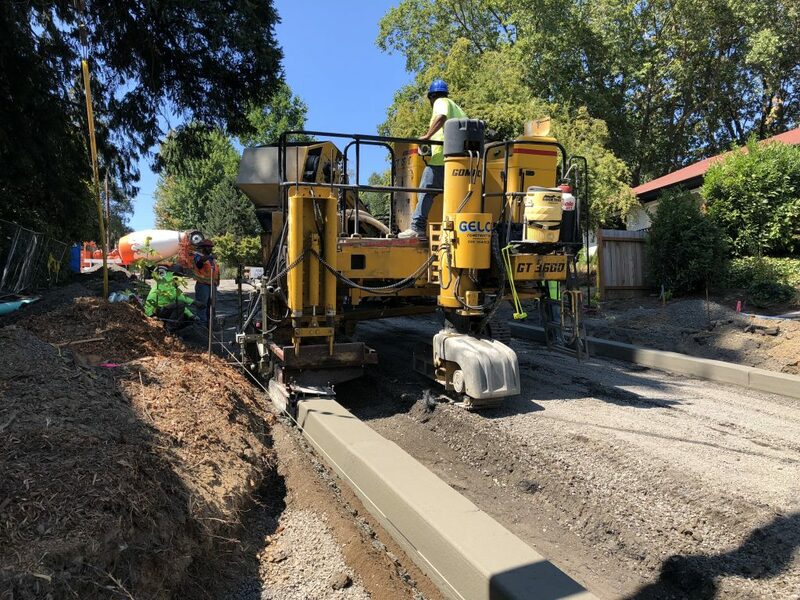 First Base Layer of Paving – Next Week! 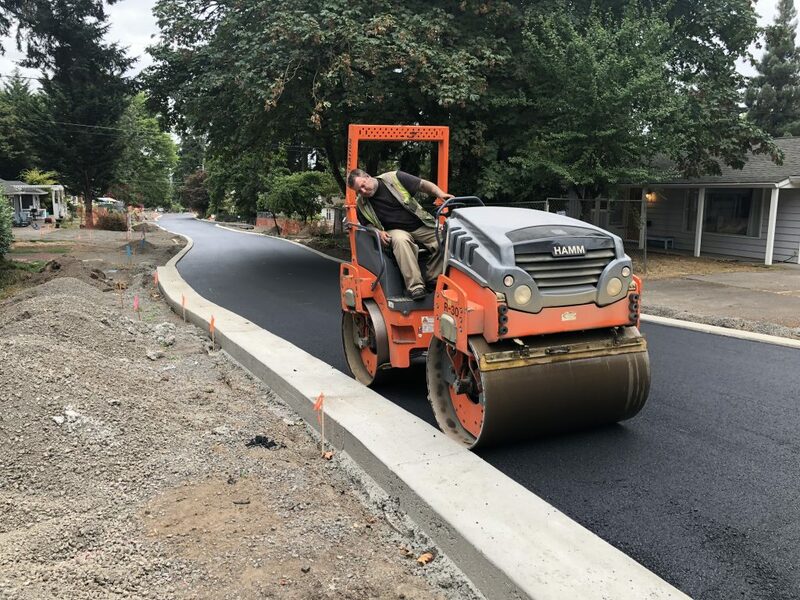 On Thursday, August 23, and Friday, August 24, crews expect to place the first 3-inch base layer of asphalt along the entire ten blocks of D Avenue. This will result in a complete closure of D Avenue and all north/south cross streets, except State and 10th Street. All traffic will be detoured to 10th Street, and E and C Avenues. This is to allow the new pavement enough time to cool. Soon after, crews will also be paving 1st Street between D and E Avenues. Neighbors who take driveway access on 1st Street will receive a door hanger 48-hours ahead of the paving scheduled for your street. During the paving, residents will need to park on side streets. Neighbors should expect an increase in noise and vibration during the paving preparation and placement. Crews will be using a vibratory roller to compact the rock and newly placed asphalt, which creates vibration. Thank you for your continued patience and understanding with the construction. Crews are hoping to reopen D Avenue to through traffic by August 27, in time for school! 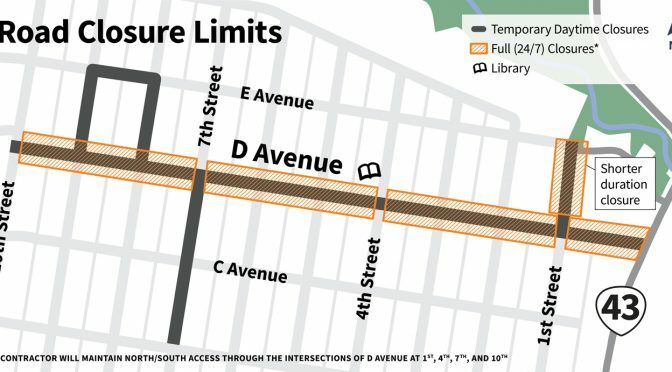 Although the FULL closure for the entire ten blocks will be lifted, intermittent daytime closures will still be in effect over the coming months as crews finish the next stage of the project. 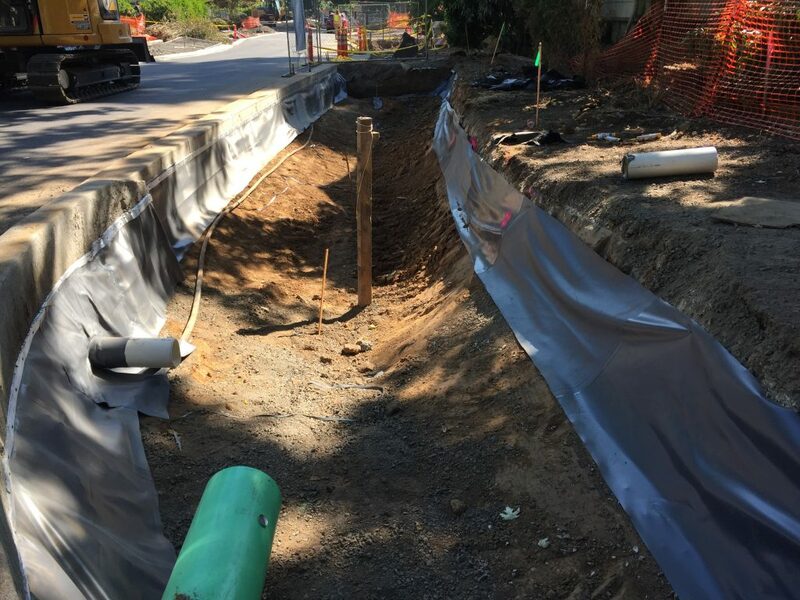 This work involves building the stormwater rain gardens, pouring the sidewalk, installing the bollard lighting, placing the landscaping and miscellaneous restoration work. Please note, there will be one more occurrence when the entire roadway will be closed and the 10th street detour will be in place when the final top lift of pavement is placed (stay tuned for more information on when). Remember, the road closed signs and caution tape are there for a reason – to keep you and the crews safe. Please do not attempt to move the signs or pull the tape off, including during evenings and weekends. Please do your part to stay safe, keep our construction crews safe, and keep this project moving towards the finish line. Thanks for your patience. The major road excavation is now complete along the ten blocks of D Avenue! Starting today, the concrete crews are beginning to install stakes and place forms in preparation for the concrete flatwork. Next week, the concrete placement will begin for the roadway edging, valley gutters and intersection curbs. This work is expected to continue for a few weeks. Neighbors will notice an increase in concrete trucks coming and going from the project area. There will be times when driveways on D Avenue will be blocked during the concrete work, and residents will need to park on side streets. Crews will work one-on-one with residents to provide reasonable and safe access. Thank you for your continued patience and understanding! While it might not look like much activity is taking place in some of the closed areas, the entire roadway is dug out. Crews are moving up and down the corridor throughout the day. Manholes are exposed. Trenches are open. Survey stakes are being placed. Concrete forms are being installed, and starting next week, concrete will be poured along the entire corridor. D Avenue is completely closed to east-west traffic from State to 10th Streets. If you need to cross D Avenue, please only use 1st, 4th, 7th or 10th Streets. All other streets and alleys are closed at D.
As a reminder, please do not park in the alleys. This blocks emergency access and Republic Service garbage collection. Don’t be this person! Road closed means YOU! It’s pretty simple, when there’s a road closed sign posted, it means the road is CLOSED…for all vehicles, pedestrians, bicyclists, dog walkers etc. Disobeying the road closed signs and driving through the closed areas – like this person pictured in the black car – is a traffic violation. LOPD has issued many citations, and continues to patrol the neighborhood. 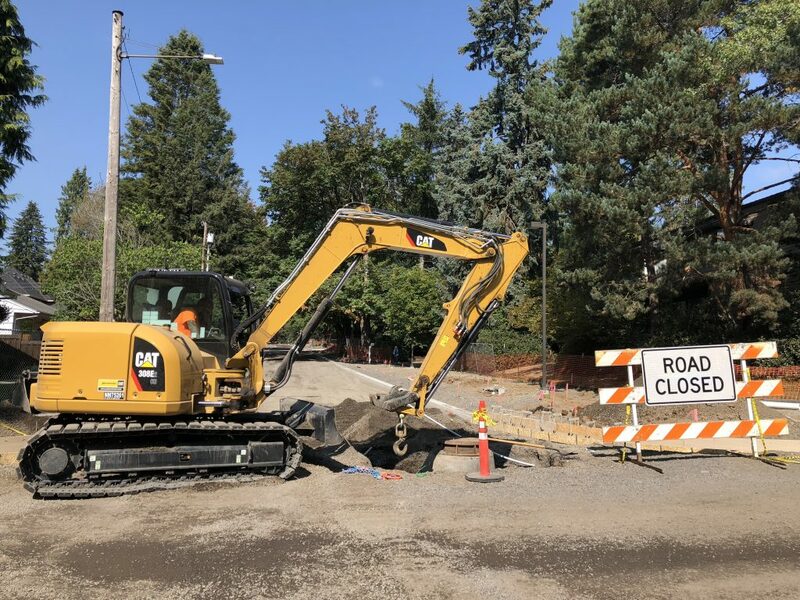 Last week after work hours, one vehicle drove around the barricades at 5th and D, into the work zone, through an irrigation trench and crashed into a newly installed storm line manhole. 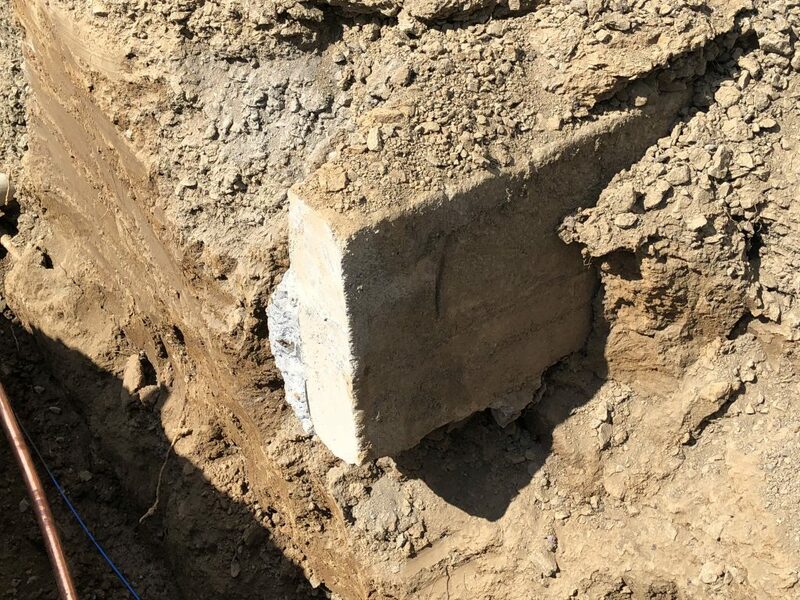 The damage was so intense that the manhole needed to be completely dug out and replaced. A police report has been filed. If anyone has more information about this incident, please contact LOPD on 503-635-0238. Unfortunately, traffic and safety violations are escalating on D Avenue. 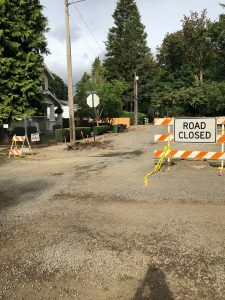 Not only are people cutting through the closed areas, during and after work hours, but road closure barricades and sidewalk signs are being moved out of the road and alleys. Safety caution tape is being cut and ripped off from the barricades and signs (pictured below). This is happening multiple times a day, and it is not only impacting Emery’s productivity and ability to conduct their work safely, but it is impacting the public’s safety. 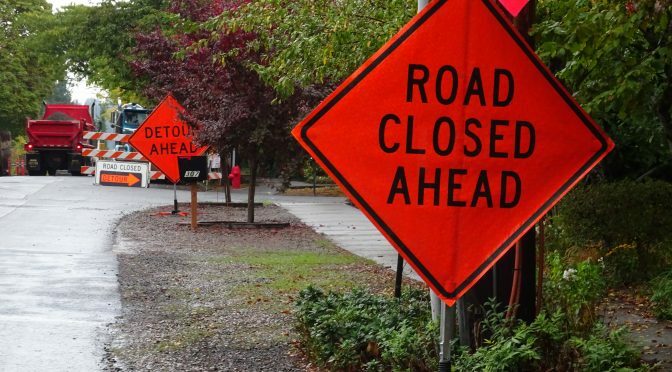 The road closed signs and caution tape are there for a reason – to keep you and the crews safe. Please do not attempt to move the signs or pull the tape off. The City is increasing surveillance through increased police patrols and the project team may also install security cameras. All drivers, pedestrians and cyclists – please use the open streets (1st, 4th, 7th or 10th) to cross D. The other cross streets and all alleys are CLOSED to through traffic between C and E Avenues 24/7. Please do your part to stay safe, keep our construction crews safe, and keep this project moving towards the finish line.